Red Deer, Alta. – Graeme Clarke (Ottawa 67’s) set up Connor McMichael (London Knights) for the game winner with 2:49 remaining as Team Orr completed the biggest comeback in Sherwin-Williams CHL/NHL Top Prospects Game history to stun Team Cherry with a 5-4 win at The Centrium in Red Deer, Alta. Team Orr scored three times in the final four minutes of regulation, marking the first third period lead change in the event since 2010. Kelly Hrudey’s squad recovered from a 4-1 deficit to claim victory as Clarke earned Jim Gregory Player of the Game honours for his team with a goal and an assist. Down by three, third period goals from Jakob Pelletier (Moncton Wildcats), Nikita Okhotyuk (Ottawa 67’s) and Brett Leason (Prince Albert Raiders) tied the score at four before McMichael beat goaltender Taylor Gauthier (Prince George Cougars) over the shoulder for the game winner. “At about the four minute mark I saw some people get up and start to leave the building with the score 4-2,” said Clarke. “That just goes to show that anything can happen, obviously with our three quick goals and we got the win so it’s pretty exciting. Peyton Krebs (Kootenay ICE) earned Jim Gregory Player of the Game recognition for Team Cherry while linemates Arthur Kaliyev (Hamilton Bulldogs) and Nick Robertson (Peterborough Petes) each finished with three points. “We had some tough bounces there at the end, the ice got a little chippy but in the end that was on us, we should’ve battled back,” said a disappointed Krebs. Kaliyev didn’t waste any time putting Team Cherry on the board, setting a new event record with his goal 56 seconds into the first period. The big winger used a quick release off a nice feed from linemate Nick Robertson (Peterborough Petes) entering the zone. Samuel Poulin (Sherbrooke Phoenix) would extend the Cherry lead to two beyond the midway point of the period. Stationed in the slot on the power play, Poulin whacked a rebound past Hunter Jones (Peterborough Petes) at 11:56 as defencemen Michael Vukojevic (Kitchener Rangers) and Thomas Harley (Mississauga Steelheads gathered assists. Down 7-1 on the shot clock at that point, Team Orr would find some life late in the first but Team Cherry netminder Mads Sogaard (Medicine Hat Tigers) was up to the task, stopping all eight shots he faced. Team Orr came out with some jump in the second, forcing Sogaard into an early denial of Nikita Alexandrov (Charlottetown Islanders) as he walked out of the corner. A sensational solo effort broke the offensive silence for Team Orr as Clarke made his way around an opposing defender before tucking a forehand deke past Sogaard at 4:29. The high-paced second period saw the two clubs combine for 31 shots on goal as Krebs reinstated the two goal lead for Team Cherry with 2:59 left on the clock. Robertson picked up his second primary assist of the game, this time on the power play as he found Krebs creeping in off the point for the finish. Kaliyev pushed Team Cherry ahead by three with his second goal of the night 2:18 into the third period. Robertson collected his third assist in the process as Ron MacLean’s club looked to be in full control with a 4-1 lead. 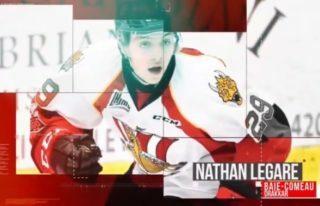 Jakob Pelletier (Moncton Wildcats) got the momentum swinging back the other way with help from Kirby Dach (Saskatoon Blades) and Brett Leason (Prince Albert Raiders) at 4:42. The speedy winger slipped through the Team Cherry defence to slip a backhand deke through the five-hole of Gauthier to cut the deficit to two. After Okhotyuk scored on a point wrister through traffic with 4:01 remaining, Leason followed up with the game-tying goal less than a minute later, doing so with an assist from defenceman Jake Lee (Seattle Thunderbirds). 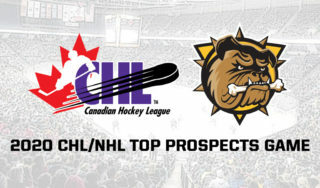 McMichael completed the comeback just 26 seconds later, putting Team Orr back in the win column following consecutive losses in the past two years at the Sherwin-Williams CHL/NHL Top Prospects Game. “Graeme threw a nice pass across and then he slipped it through the seam there to me and I just picked the corner and thankfully it went in,” said a smiling McMichael of the moment. Team Orr’s three goals 1:12 apart falls just five seconds shy of last year’s record set by Team Cherry’s Aidan Dudas (Owen Sound Attack) and Ty Dellandrea (Flint Firebirds) in Guelph as the two combined for three goals in a span of 1:07. Colten Ellis (Rimouski Océanic) picked up the win in goal, turning aside 15 of the 17 shots he faced in relief of Hunter Jones (Peterborough Petes). Jones departed with his team trailing 2-1 having stopped 18 of the 20 shots that came his way. Mads Sogaard (Medicine Hat Tigers) started the night in the Team Cherry crease, stopping 17 of 18 shots. Taylor Gauthier (Prince George Cougars) surrendered four goals on 16 shots the rest of the way. Team Cherry finished 2-for-2 on the power play, outshooting Team Orr 37-34. Team Orr improves to 14-6 all-time at the Sherwin-Williams CHL/NHL Top Prospects Game before a crowd of 5,432 at The Centrium. Team Cherry’s all-time record falls to 7-14.